After scribbling all over his strips, cutting them and folding them up, Onetime dashed excitedly outside to the back deck of our house to test his new “Flying Fish” paper spinners! “It spins Mommy! It spins!” he yelled as he ran down to the backyard to retrieve his new creation. They cost exactly $.50 to make at least 10 and they entertained us for at least 45 minutes yesterday. Frugal fun for blah days! 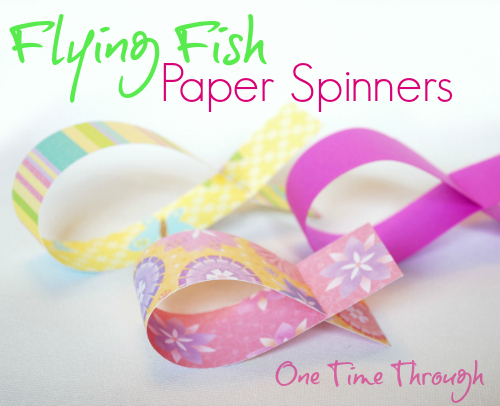 Check out our instructions for the Flying Fish Paper Spinners and this week’s Love to Learn Linky today! H is for Helicopter: A STEM Exploration from Mommy Crusader and Her Knights and Ladies. 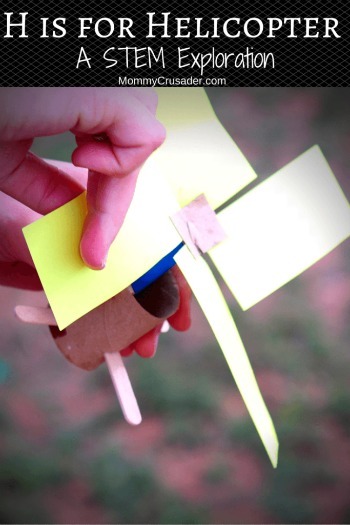 This busy blogging mom did a fantastic scientific exploration of paper helicopter making with her kids. They created and tested their own flyers – learning the whole time and having fun too! Be sure to check out her post! 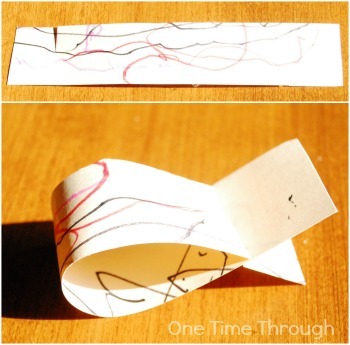 While our flying fish paper spinners, are not an open-ended creative activity, they are quick and FUN to make and test too! That’s it! You might want a pen too, but I’m sure you have one kicking about! Basically, you cut your paper into long strips about 2cm wide and however long you want. A couple centimeters from each end, make a small line as shown in the picture to the right, and have your child snip along the lines. 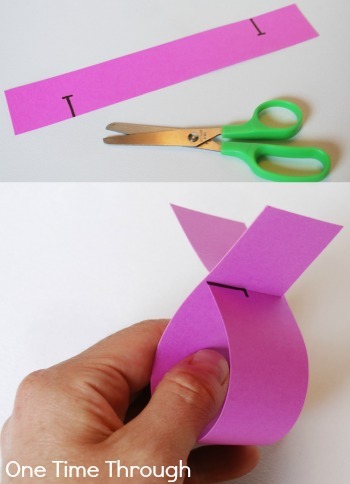 Show your child how to bend the paper and cross the pieces so the tail holds itself together. They just slide in along the slots. Onetime also had fun decorating his flying fish. I think he told me he was drawing pipes and sewers. Um…okay. I’m not surprised though. Ever since we started investigating how toilets work in our house last week, everything has been about pipes! After we had made a pile of fish of different sizes and colours, we had fun tossing them off the back deck for a good half hour. The fish look so cool as they are flying! It’s really hard to explain and impossible to catch on either a camera or a video camera – believe me I tried! But your kids will love it too. If you want to get more scientific about the whole activity, why not make fish of different lengths and widths and have your child predict which ones will go fastest, or how they might fly differently. Test out your child’s hypothesis. When you’re all done with the tossing, why not make the fish into a mobile by hanging each one from its “mouth” with thread from a clothes hanger or pretend fishing rod? 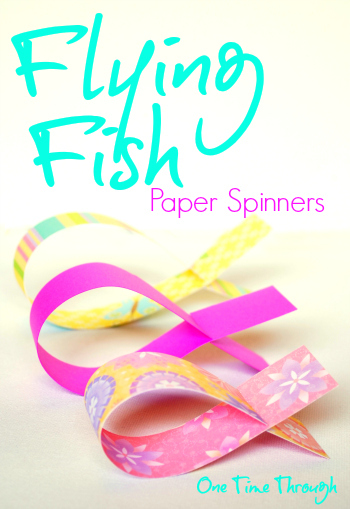 Hope you enjoy trying these adorable and FUN flying fish paper spinners! Perfect for getting the kids outside in the fresh air! Previous Post: « Daring to be Perfectly IMPERFECT Parents and Kids: Twisted Advice! What a fun idea, my kid’s will love it! Thanks for dropping by Katie. Have fun with them!